I’m the Principle Flute at Chamber Orchestra of New York with 10 years of teaching experience. I’d love I help you work on your flute skills! Praised by the Italian press as being “one of the most interesting talents of her generation”, and described as having “a beautiful phrasing, brilliant virtuosity and a legato worthy of a great singer” by The Flutist Quarterly, Ginevra Petrucci has performed in some of the most prestigious concert halls throughout Europe (Sala Accademica di Santa Cecilia and Villa Medici, Rome; Teatro La Fenice, Venice; Sala Maffeiana, Verona; Villa Pignatelli, Naples; Salle Cortot, Paris; Liszt Academy, Budapest; Chopin Academy, Warsaw), America (Carnegie Hall, New York; Kennedy Center, Washington D.C.), Japan (Ohji Hall, Tokyo), China, South America and Middle East. She performs regularly with artists such as Bruno Canino, Rocco Filippini, Paolo Carlini, Luca Vignali, Boris Berman, David Radzynski, Emmanuel Ceysson, Jory Vinikour and with the ensembles I Virtuosi Italiani, I Pomeriggi Musicali, I Musici di Roma, the Kodály Quartet. Her recordings include Giulio Briccialdi’s four flute Concerti with I Virtuosi Italiani, Friedrich Kuhlau’s quintets with the Kodály Quartet, Haydn's flute Duets, the recital CD "The World of Yesterday" with Bruno Canino, Dupuy and Büchner’s Concerti with I Pomeriggi Musicali, the first CD entirely dedicated to the flauto d’amore and an all-Muczynski album. She is visiting professor at international institutions such as the Royal Academy in Dublin, the Paderewski Academy in Poznan, the Conservatorio Superior in Vigo and La Coruña, the European Culture and Performing Arts Association in Tokyo etc. She has worked with composers Kaija Saariaho, Steve Reich, George Crumb, Betsy Jolas and Jean-Michel Damase and she collaborates with Nuova Consonanza Contemporary Music Festival and La Biennale di Venezia. Born in Rome in 1989, she studied at Conservatorio ‘Santa Cecilia’ of Rome with her father, to continue her education at Ecole Normale ‘Alfred Cortot’ (Paris) with Pierre-Yves Artaud and at the Yale University (USA) with Ransom Wilson. She is the President of the Leonardo De Lorenzo Association. 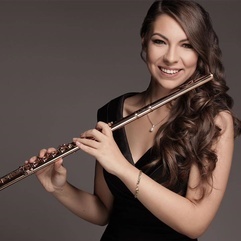 She is currently Principal Flute at Chamber Orchestra of New York. No reviews yet. We offer a money back guarantee if you are not happy with your lesson, so why not try a lesson with Ginevra? Take live online video lessons with professional, passionate Flute or Piccolo flute teachers from around the world. All you need is a computer equipped with a webcam and microphone. Learn more about how it works.